"Knowing Our Water - The UC Water Academy Journey" is the newest video from UC Water for UCTV's Sustainable California channel. April is Earth Month. It’s also when UC Water Academy — an intensive course aimed at training the next generation of California water experts — starts its second year. To mark the occasion, UC Water released its second video for the UCTV Sustainable California channel. “Knowing Our Water — The UC Water Academy Journey” tells the Academy’s story from the perspective of students and faculty members who participated in the inaugural year, and gives viewers a glimpse into the inner workings of California’s water systems. Launched in 2017, UC Water Academy is a 12-week course open to undergraduate and first-year graduate students at all UC campuses. The course is led by UC Merced Professor Joshua Viers and UC Berkeley Professor Ted Grantham and has grown to include geomorphology specialist and UC Davis Project Scientist Sarah Yarnell. The Academy recruits and trains students interested in careers in California water management. Last year’s 12-member inaugural class included students from four UC campuses, and this year’s class includes seven graduate students and five seniors representing eight campuses. The Academy includes an online discussion component in which students learn the essentials of California hydrology, water management and about pressing state water issues. But for many in the Academy, the highlight is the nine-day field course through which students take an expert-guided tour of key water sites around the state — from source waters in the Sierra Nevada to major downstream dams and reservoirs and finally to farms and cities that consume water. And then there’s the three-day whitewater rafting trip. 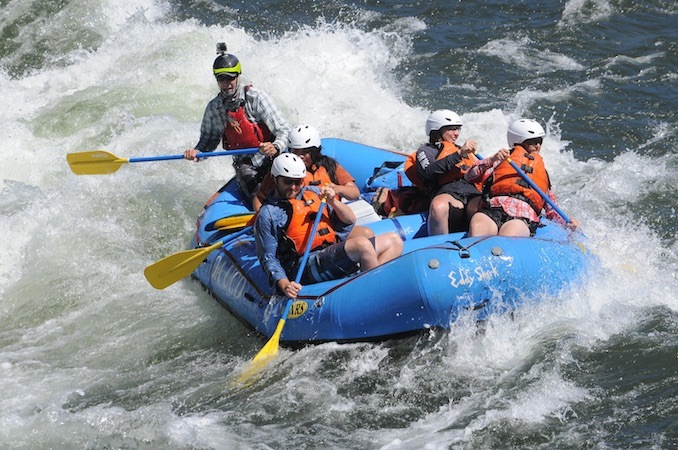 Last year’s class rafted the south fork of the American River, highlighted in the video. This year’s class will raft the Tuolumne River. UC Water Academy participants rafting the south fork of the American River. “Knowing our Water” is UC Water’s second video about California’s water system. Last year, UC Water and UCTV released “Water in the Balance” — a five-minute video tour tracing the journey of California water from Sierra snowpack to Central Valley farms — a path similar to that traced by students in the Academy field course. Viewers can watch both videos and subscribe for more on the UCTV Sustainable California website. More information about UC Water and the UC Water Academy are available at ucwater.org.